Help Wanted: The Philippines Needs More Exorcists : Goats and Soda The Office of Exorcism reports a sharp increase in cases over the past decade — more than its five-man team can handle. Warning: It's a high-stress job. The priests believe the demons strike back. 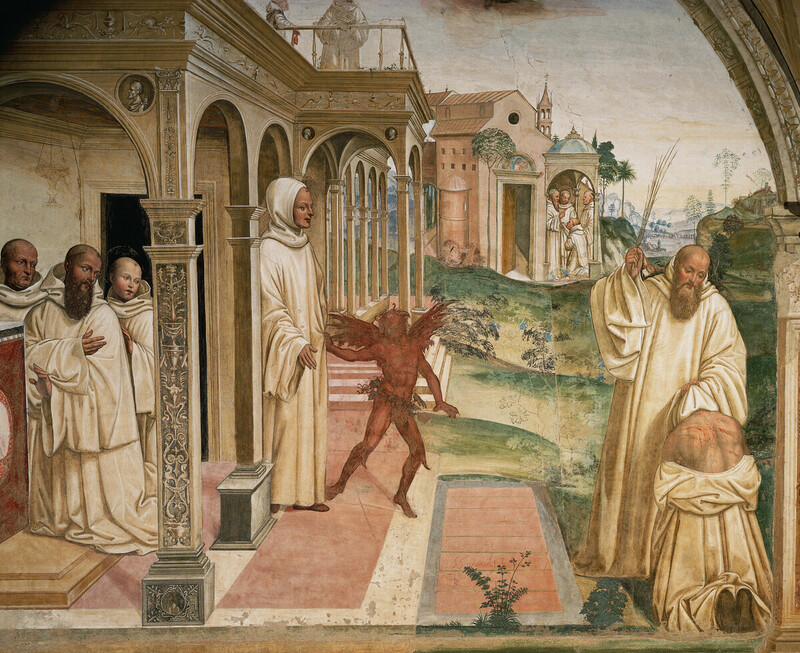 In this 16th-century painting, Saint Benedict exorcises a demon from a man possessed. Alvin Bailon and his wife were at their wits' end last September. Their 12-year-old son, an honors student, had begun having anxiety attacks, mostly about school. "And then all of a sudden he would slowly lose consciousness," Bailon recalls. "We term it as doze off. He would doze off and he would fall down slowly." They brought him to three doctors, had his brain scanned (no irregularities were found), tried all sorts of anxiety pills prescribed by doctors. They even went to healers who use crystals for therapy. Then they tried a beach retreat that the healers had recommended. Their son did well, but Bailon says on the car ride home the child "dozed off" and whispered in a totally unfamiliar voice, "Shhh, you might wake him up." 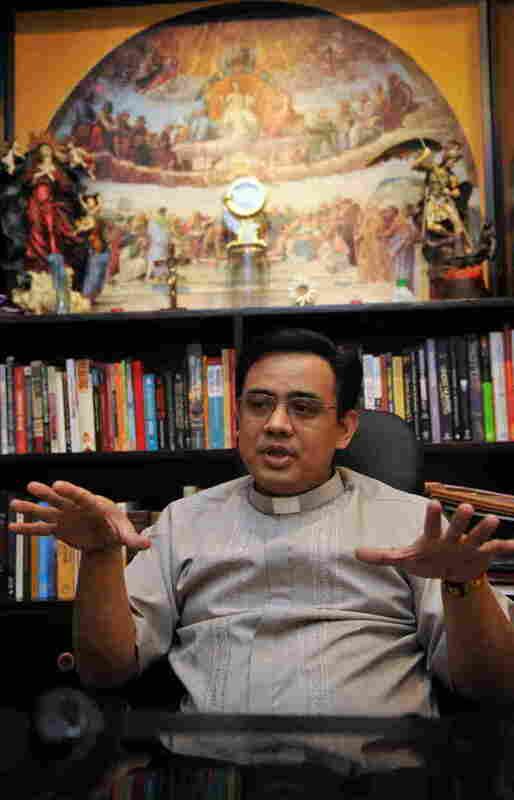 Father Jose Francisco Syquia heads the Office of Exorcism in the Philippines. That's when the Bailons did what many in the overwhelmingly Catholic country do when facing a family crisis: They turned to the church — and its Office of Exorcism, opened in 2006 to address a growing number of cases and run by Father Jose Francisco Syquia. Dressed in a short-sleeve button-down shirt, the Rome-trained exorcist says he has been driving demonic spirits out of people and houses for more than a dozen years. He has seen a steady increase in cases in the past decade, with 200 so far this year. "At any given time we have at the minimum 30 cases," says the 48-year-old. "And we're only five exorcists." Father Syquia leads a team of four priests who get additional assistance from volunteers: psychiatrists, doctors, lawyers and laypeople. Given the number of cases he's juggling, Syquia recently sent a letter to the Philippine bishops conference asking that it send one resident exorcist to each of the country's 86 dioceses. "[The] majority of them do not have exorcists or a team of exorcists that deal with these kinds of cases," says Syquia. "Therefore many of the Filipinos tend to go to the occult practitioners, what we call the faith healers, spiritists, etc." Syquia believes these occult healers are responsible for the increased number of demonic possessions. The healers leave a person with "spiritual openings" that allow demons to latch on, he says. Meanwhile, it's a draining job for the official exorcists. Just one session of prayers for a possessed individual can last four hours. And it may take several sessions, according to Syquia, to drive out evil spirits. "That's very tiring," says Father Winston Cabading, secretary general of the University of Santo Tomas and a member of Syquia's team. Not only that, the exorcists also have to deal with the aftereffects. They believe that demons retaliate against the priests. "You expect that there will be more, what we call, retaliations because you are jumping into enemy territory and retaking ... what truly belongs to God," says Syquia. "And therefore it's more like maybe a commando raid behind enemy lines." At least one of Syquia's trainees quit. Syquia says the trainee believed he had developed unexplained illnesses because of the work he was doing. Nonetheless, Syquia believes young priests and seminarians have a real interest in spiritual warfare. And if they stick to it, they can help people like Alvin Bailon's son. After 10 months and 14 prayer sessions, Bailon says the boy is almost his old self. "We've seen a lot of improvement in my son's condition, which is most important," the father reports. "He's back in school. He's doing so well, he's actually very independent."